I’ve been a huge fan of The Sims franchise since the first one came out. I got every game and expansion pack that was released and I even shamelessly bought stuff for my Sims using real money. I always loved how the franchise progressed and I had little complaints. Sometimes developers would take out some features in the next game, but it was always a huge step forward. The Sims 2 was a huge improvement in terms of gameplay and graphics. The Sims 3’s biggest achievement was its seamless open world and how Sims can go about their lives on their own with story progression. I think a lot of people would agree that this was not the case in The Sims 4. The introduction of the emotions and multitasking feature was a real game changer, but the absence of open world and story progression underscores its impact for most fans. I was one of these fans and I never thought that I would never buy anything from the series at least for a while. Outdoor Retreat was not on my radar, but I opted to get it after reading and watching pleasant reviews about it. This is one review I checked out. So, what’s a game pack? I initially thought that this was essentially a rebranded stuff pack. However, it’s comparable to buying a “world” in The Sims 3 because Outdoor Retreat comes with items, clothing, new gameplay, and a new area. It’s not enough content to warrant it being called a full expansion pack, yet it’s more than what stuff packs generally had. 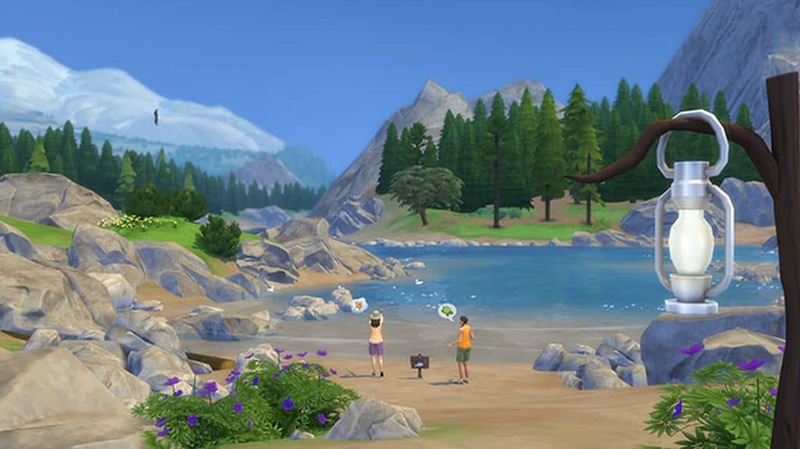 Outdoor Retreat allows Sims to go on a vacation by visiting a forest/campground filled with trees and lakes called Granite Falls. It’s not like past vacation packs wherein there was a variety of distinct areas one could visit though. This game pack is much more focused on camping in general. Hopefully, this means that there’s still going to be a more comprehensive expansion pack coming out in the future similar to World Adventures, Vacation, and Bon Voyage. One of the things I immediately noticed was that I could finally invite Sims outside of my household to join me on a vacation. You won’t get to control them, but that’s not really an issue. This was a feature that a lot of fans wanted in past games and I’m glad that it was implemented this time around. At the same time, you can always invite your Sims’ friends in the middle of the vacation if you forgot to bring them along in the beginning. The size of Granite Falls is comparable to a regular neighborhood size featured in The Sims 4. There are campgrounds, cabins, forests, and lakes to explore. Additionally, you don’t need to purchase a cabin or vacation since everything is done through a rental based fee per night. The same goes for campgrounds if I’m not mistaken. All you need to do is purchase a tent and other supplies from the local ranger. It’s quite understandable you can’t permanently own a lot considering there isn’t exactly a myriad of lots available. It would have been nice to at least have the option though, but it’s not really an issue. Part of my complaint stems from the fact that I can’t enter buy mode during the vacation. I wanted to have music in my cabin, but it wouldn’t let me buy a stereo. I guess I should just be content with a guitar and songs around the campfire. Granite Falls is populated by randomly generated NPCs and sometimes you can even encounter townies from your neighborhood. The great thing about is that it’s not always the same group of people each time you visit. Time also passes and Sims age during the vacation. I find this to be a welcome feature since it’s more realistic and it doesn’t make sense that they would stop aging on vacation. If your household can’t afford a vacation, they can always camp out in their backyard and improvise. Outdoor Retreat also gives its players a sizable amount of new hairstyles and clothing. The new stuff allows me to get into the whole camping vibe and it still looks awesome even if you wear it during your Sim’s everyday life. I won’t say that there’s a crap ton of new things that you can do, but it’s a decent amount of new gameplay. Sims can gather around the campfire to roast hot dogs together, tell stories, and play around the fire. The multitasking really works well with this element of the game pack. Sims can play around with the horseshoe activity with others too. The lake is available for fishing activities as well. However, I noticed that I can’t do anything besides that. I was hoping that I could swim in the lake at least. At most, I was expecting the chance to go canoeing because isn’t that a staple of camping?! Individual Sims can go hiking as well if you click on them. I was surprised by the fact my Sims were passing other lots in Granite Falls. I was immediately puzzled and wondered if Maxis subtly made The Sims 4 open world again. Of course not, it was too good to be true. Your Sims might be able to walk past other lots, but you’ll have to go through a loading screen to actually visit them. I honestly think that the loading screens wouldn’t be such a big deal in the first place if there was a lot to do in the base game from the get-go. However, I can understand how this really feels like a big step back for most despite the lightning speed. Anyway, the hiking activity could be improved since all my Sim did was walk around. He didn’t stop to open a map or observe their surroundings. I was hoping that some random event could occur during the hike, but I didn’t encounter anything at all. The game pack also introduced a new skill called Herbalism to the game. I didn’t really dabble too much into it, but it’s not that different from other skills featured in the base game. Sims collect herbs and insects and they will be able to brew their own concoctions through various recipes. Consuming herbs and concoctions affect Sims in different ways. Some can affect their emotions in a negative or positive way, while there are elixirs that can increase the chances for twins and triplets. In the end, I don’t regret purchasing The Sims 4: Outdoor Retreat especially since I was able to get it at $16 during a timed promo. However, I think that $20 is a fair price tag for the bundle of new features it introduced to the base game. I’m not sure if Maxis is solely going to do game packs from now instead of full expansion packs and stuff packs. I do hope that they’ll still release full expansion packs because we need a more extensive vacation expansion and others like the Open for Business, Nightlife, and other popular packs. It’s still a long way before I fully drown myself in The Sims 4 like I did in past games, but the arrival of Outdoor Retreat gave me hope that it can at least redeem itself after several other expansions. It’s unfortunate that we would have to go through a series of paid expansions to get there. However, fans would probably be willing to pay the price as long as Maxis gives us loads of content in the future without exploding the cost. Good article. I haven’t played much of the Sims 4 and an holding myself back from buying expansions for it for now since I still have all of the Sims 3 ones to play with. But I’m glad to hear that this is a good pack – I might consider it eventually. Yes, I do think it’s good but I do recommend waiting out until two or three more expansion and game packs then buy it all together. They usually bundle stuff together!